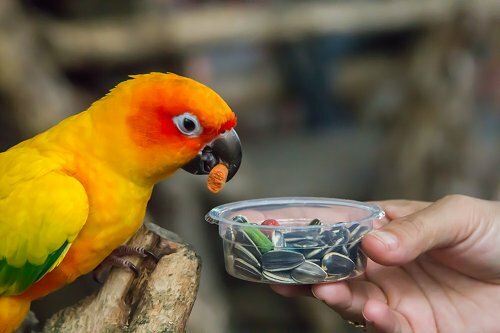 Converting your bird to a pelleted diet sometimes takes persistence and patience, but the pay-off is great: better nutrition and longer life for your bird, less mess and clean-up for you. When converting your bird to any new food, you must observe the birds carefully. Their droppings should stay about the same number and not be black. Black droppings mean the bird is not eating. Either weigh your bird or feel its breast to check for weight loss. If the bird loses 10% of its body weight, return to its regular diet and try again in two weeks. Mix the new food with his regular diet and gradually decrease the former food. The bird in the picture is getting used to pellets and morsels of a new diet mixed in with his sunflower seeds. For palatability, moisten his new food with water or fruit juice, decreasing the liquid over time. In the evening, take the bird off the regular diet and offer only the pelleted diet over the next day. If the bird has not eaten during that time, give it back its regular diet for fifteen minutes, and repeat the procedure. Moistened foods should be removed from the cage after four hours. Food and water cups should be kept clean at all times to reduce the growth of harmful bacteria. Extra vitamins and supplements should be used if you are feeding a seed diet, but should not be necessary if you are feeding a pelleted diet. Store all foods in a cool dry place or refrigerate.